For 2017 Blizzard has replaced their Magnum and XPower series skis with the Quattro set of sticks. Quattro encompasses both men’s and women’s skis, which have been designed to best accommodate the differences between the sexes. What a great concept! But Quattro is not just a ski, it is a system ski. That means that the bindings were designed specifically for the ski they sit atop, and working together, ski and binding provide a partnership that really makes these skis sing. Less chatter over crust and crud. Better holding power in tight, high speed carves, even on crusty, snow bare patches of trail. The Quattro design is a winner. 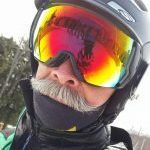 I skied the men’s Quattro skis twice, once at Killington and once at Stratton. In both situations the snow, as it was much of last season, was icy, crusty, and glacier-like. Despite the less than ideal conditions, the Quattro Ti skis—those with titanal inlays—bit in, held, and performed like a wonder. The Quattro skis lacking the titanal didn’t hold quite as well, but for intermediate level skiers or on conditions more “normal” than 2016, the “non-Ti” versions would present no problems for those having them underfoot. For the women, Blizzard stiffened the Quattro with titanal in some, carbon in others. But they lightened up the skis by using bamboo, which is not only light, but torsionally very strong. The result? A lighter ski that is no less “hard charging” or performance oriented than the men’s version. And they didn’t skimp on the women’s bindings, making them an integral part of the package to reduce vibrations and increase stability on edge. Bravo to Blizzard. The Blizzard free ride ski line—Bonafide, Brahma, and Cochise for men; Black Pearl and Cheyenne for women—sport new graphics, and some strategic placement of carbon fiber at the tips to make them a bit more responsive and “grippy” on the groomers. But basically these stay the great skis they have been, and continue to be. Yes, Avie’s has some of the new Quattro skis available to try on the slopes. I give them a massive “thumbs up” as one of the best new skis for this season. The new design is a major leap forward in performance from the XPower series, which were already pretty darned good skis. Check out the Quattro line. They won’t disappoint. 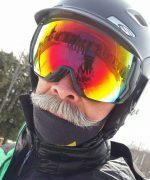 This entry was posted in Gear Knowledge and tagged blizzard, gear, ski on January 17, 2017 by Alan Desbonnet.